Metals interact with light that falls on its surface. The perception of color is actually the result of all colors reflected from that surface. On a polished silver metal, the fraction of the white incident light which is reflected and detected to the human eye exceeds 90 per cent, no mater what the color of the light. This is superior to any other metal alloys used in jewelry, including Platinum. Pure silver is too soft to be used for articles that are subject to heavy wear or usage. For 5000 years, copper has been added to pure silver to impart hardness and durability, making this precious metal suitable for a wide range of uses. An alloy containing 92.5% silver with 7.5% copper was used to set the standard for English currency during the 12th Century - this became known as "sterling silver". A silver alloy can be classed as sterling quality so long as it contains at least 92.5% silver. The remainder of the alloy can be made up of any other element or combination of elements. Sterling, at over 92% silver, is quite pure. Perhaps this metal’s most remarkable attribute is the way it ages. Silver patinas so beautifully that designers often exaggerate that quality, incorporating recesses protected from the natural polishing of everyday wear, and even pre-oxidizing the surface. Sterling silver is a copper-silver alloy and is somewhat softer than most gold alloys. Therefore, it is more likely to be abraded to black dust by movement between the jewelry and the skin or clothing. A few people, especially with moist skin, may find that the sterling silver stains their skin green due to the copper component of the silver alloy. When this occurs they should polish their jewelry frequently and use an absorbent, non-abrasive powder on moist skin areas that are exposed to the jewelry. Soaps, detergent, wax, polish, and cosmetic creams may build up under a ring causing a type of dermatitis. To prevent this, they should remove all rings before using soap or detergent, and clean the rings frequently. Silver jewelry should be removed before using photographic chemicals. At Hannon Jewelers, we use several methods to clean silver jewelry.We often recommend an industry tested chemical that contains thiourea. This chemical - as for any other chemical - should be used with care to protect yourself and to prevent allergy reactions. This liquid provides an almost instant cleaning action that removes tarnish from silver and will also remove factory and desirable oxidation on silver jewelry. Another method we also recommend, is to rub the tarnished silver jewelry with a mixed paste made of baking soda and water. Baking soda is known to neutralize many kind of chemical oxidations and acids such as those tarnishing traditional sterling silver. For more information on our Fine Jewelry cleaning, inspecting and restoring, please click here. 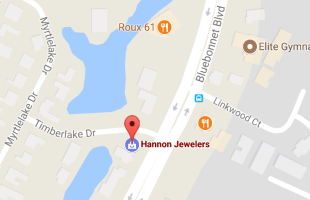 At Hannon Jewelers, we are starting to use a new silver alloy called Argentium Silver. This new innovative metal has many of the traditional sterling silver properties, but it also have one starling new and desirable one. It is extremely tarnish resistant. More silver designers are now considering the use of this new silver alloy for new creations. Argentium Silver alloys contain a small quantity of germanium. The germanium oxidizes preferentially to the silver and copper in Argentium Silver, to form a transparent germanium oxide surface layer. This protective oxide gives excellent tarnish resistance. For more information on Argentium silver, please visit Argentium Sterling Silver.